PASADENA, Calif. (KABC) -- A semi-truck erupted in flames Saturday morning after it slammed through barriers and onto the light-rail tracks on the 210 Freeway in Pasadena, authorities said. According to the California Highway Patrol, the collision was reported shortly after 7 a.m. near Madre Street, prompting the closure of three westbound lanes and one eastbound lane. Pasadena Fire Department firefighters responded to the scene and extinguished the flames. In a tweet, the agency said no one was injured in the incident. The Fire Department later released photos of a kitten that was rescued by firefighters after it ran across the freeway and under the burning big rig. Gold Line service was suspended for hours in both directions at the scene. Bus shuttles transported passengers between the Sierra Madre Villa and Allen stations, according to Metro. Conditions on the freeway were slippery due to an overnight storm, but it was unclear if the rain was a factor in the crash. 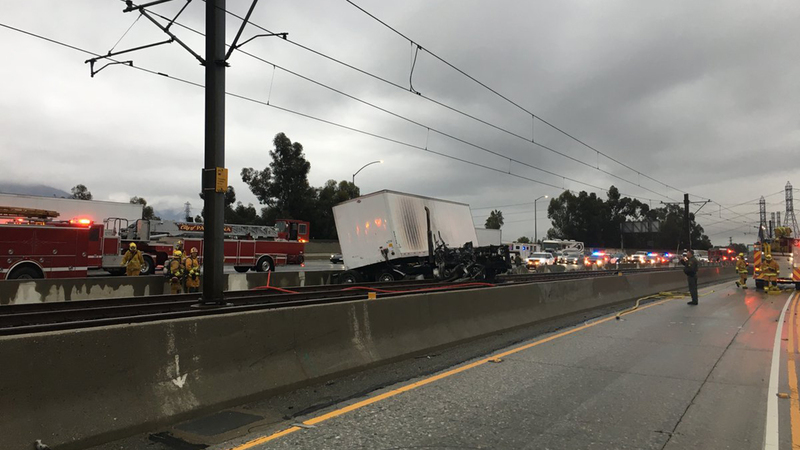 By 3 p.m., all lanes were reopened on the interstate and light-rail trains resumed normal service, the CHP and Metro said. Gold Line riders were advised to expect 15-minute residual delays until about 4:30 p.m.